Sometimes it is worth a visit to popular areas just to get to know the people there. Wong Tai Sin temple's fame for granting wishes drew huge crowds from all over Hong Kong and China, and tourists like me also like to join into the crowd to enjoy the experience. In the fenced off area in the cloister facing the main altar were a small score of believers who prayed hard for answers in the form of kau cim, where they shook a cylindrical container filled with fortune telling sticks until one fell out. The stick contained a numeral which need to be decoded by a fortune telling master to know the answer to your question. In front of the main altar stood a large cloister crowded with throngs of visitors, mostly paying their respect to the patron deity and asking for a simple blessing. 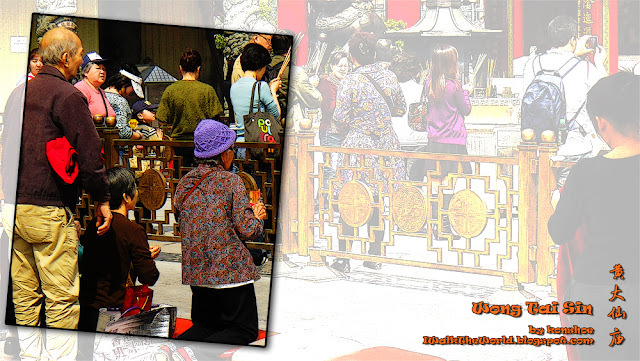 Such acts could be done by simply bowing to the deity with both palms held together or by offering joss sticks on the joss stick holders. A small area right in the middle of the cloister was bounded by ornate wooden low fences, creating a relatively empty area amidst the noisy throng. 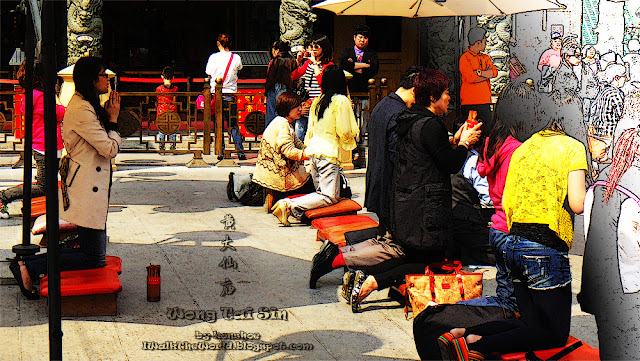 This was the area where believers who wish to obtain answers to their personal questions engaged in an act known as kau cim (求签). What did the old lady wish to know? To know the lottery number? Or to ask for the marriage date for her sons and daughters? The padded low pedestals were there to minimize the pain on the knees when the believers kneel to kau cim. 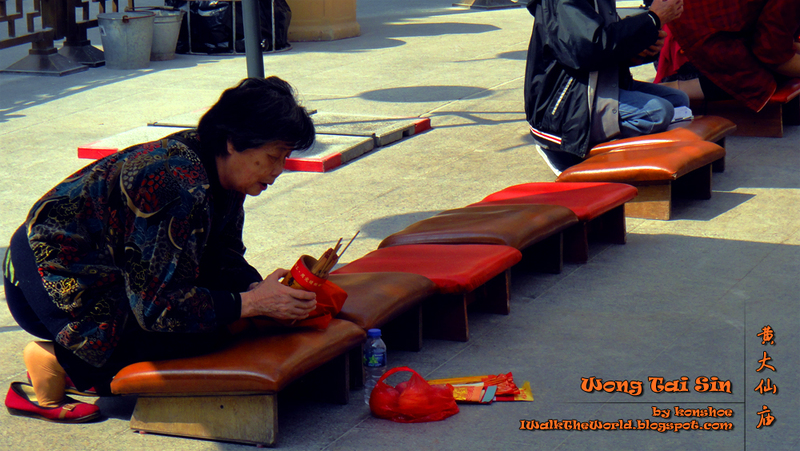 It used to be only a padded pillow, and still is so in certain temples. In the act of kau cim, the person with the question would obtain a bamboo cylinder filled with sticks, each with a number and each one of them unique. They would kneel in earnest and repeat their questions in mind, all the while shaking the cylinder full of sticks any way they want. If they did it correctly, one stick will eventually drop out, which will contain the answer. Of course, they would not be able to decode what the number was telling them, which only the fortune telling master could help. If more than one stick fell out of the cylinder, then they will need to insert the sticks back in and shake the cylinder again. Bounded by ornately carved wooden fences were the main cloister where believers prayed hard for answers to their personal questions. It was here where I could observed how people behaved when they kau cim. Despite it being a Chinese tradition, I only know of it through movies and dramas. The believe that their questions could be answered by kau cim was not limited only to the elderly. This believe is ancient, with old and young alike participating in it. This is more than just mere superstition, as it could mean quieting the inner demons for some people, much like confessions could in Catholic churches. Although Wong Tai Sin claimed the tribute of the largest altar and the temple's namesake, the temple complex was home to other deities as well. Standing one side to the cloister in front of the main altar was an array of other deities, all of which I had no inkling about. These smaller altars drew their own crowds, which though smaller, were no less fervent in their prayers. 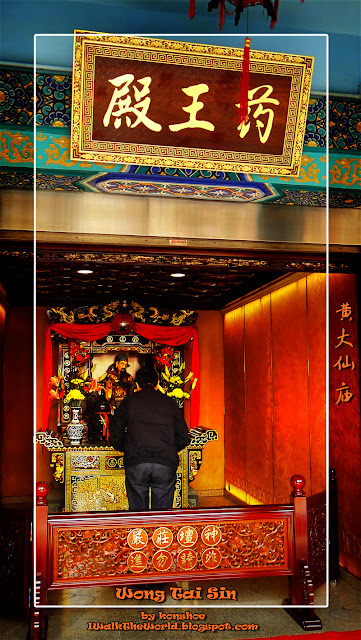 For us, the altar for the King of Medicines (藥王; Cantonese: yok wong; Mandarin pinyin: yào wáng) got our attention, with my girlfriend's weak body in need for a blessing for good health. 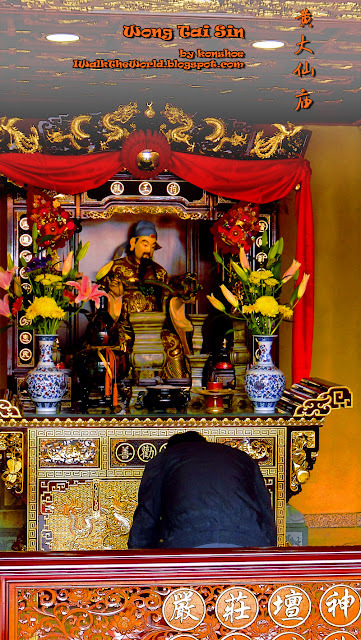 Apart from the King of Medicines, there were also altars for God of Fortune (財神; Cantonese: choy san; Mandarin pinyin: cái shén) and Gods of the Earth (福德正神; Cantonese: fook dak zeng san; Mandarin pinyin: fú dé zhèng shén). 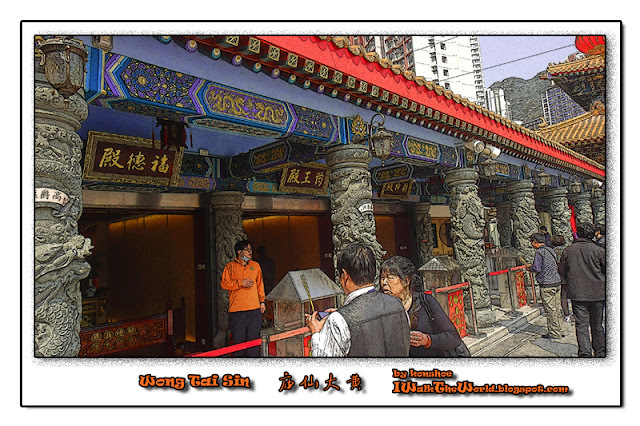 The temple of Wong Tai Sin not only paid homage but also a number of other deities. Three of those deities were housed in a row of smaller altars to one side of the cloister facing the main altar, attracting their own believers in search of blessings. The inner sanctum of the altars were cordoned off from the wandering visitors from disturbing the altar. 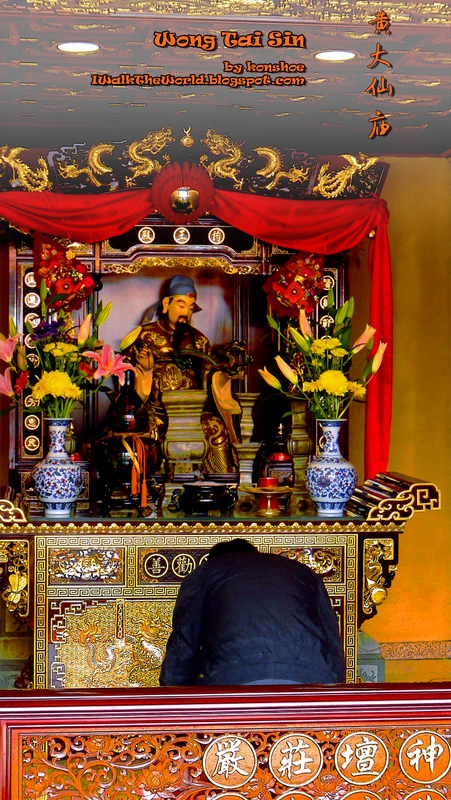 Fervent visitors who wished to pay their own homage could access the altar for their own prayers, though they may need to get the access through the temple authorities. The exact method of the prayer was not known to me. The visitor photographed here stood and knelt several times, each time with his palms held flat to each other. I believed that the method was not as important compared to his faith in the deity's power to answer his prayers and to grant his blessings. 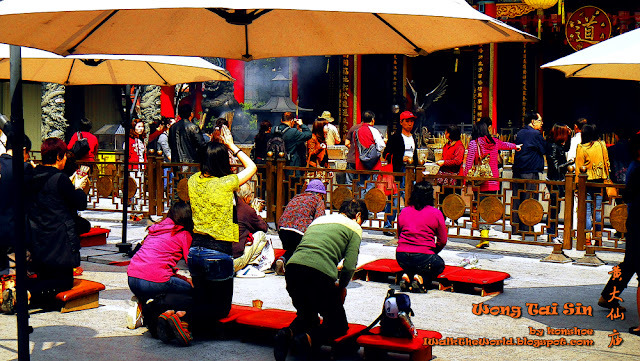 Altars aside, the temple of Wong Tai Sin hosted not only deities but also a beautifully landscaped garden at the rear of the main altar. Such artistically sculptured landscape stole my breath away, and it would be a shame not to share those with as much enthusiasm as I did for the altars of gods.